"Vampires are invading a small New England town. It's up to a novelist and a young horror fan to save it." We're five days into this year's "Hallowe'en Countdown" so I've decided to change from ghosts to my other favourite supernatural creatures - vampires! Since I'm all about quality, there's no better way to begin than with Tobe Hooper's 1979 classic TV miniseries adaptation of Stephen King's "Salem's Lot". In the 1970s, like most children who didn't know any better, I was a big fan of "Starsky and Hutch". I had the action figures, toy cars, posters, most of the books, and watched each episode religiously every Saturday night. Not long after that show ended forever, "Salem's Lot" suddenly appeared. With David Soul looking exactly the same as he did before, I'm sure a lot of people expected Paul Michael Glaser to show up at any moment. He didn't, of course. Although "Starsky and Hutch" had three notable run-ins with the occult, "Salem's Lot" was something entirely different and much scarier. 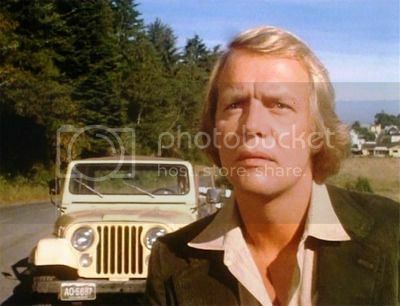 I remember being amazed at how different David Soul was in this although, as I said, he still looked like Hutch minus the stupid moustache that he grew for the final season. The biggest surprise was that he could be so serious in a role which most people would have found hilarious. He could actually act, and there was never any self-consciousness about playing an author forced to be a vampire hunter at all. There were even more shocks to come when James Mason, one of Britain's finest actors, turned up as the exceedingly suave yet creepy Straker. I had only ever seen him in war movies before and, due to my age, didn't know that he had also played Polidori in "Frankenstein: The True Story" (1973). Shamefully, I also had no idea who Stephen King was at the time either. At this point, I need to briefly change from the past tense to the present tense. I've noticed that most movie reviewers write entirely in the latter for some reason even when writing retrospectives such as this. I've always thought that a synopsis is fine in the present tense, but writing about something which you have seen and is now a done deal should be in the past tense. The argument has always been that writing in the present tense allows you to bring the movie (or book) back to life for the reader even though it's lazy grammar and reviews (literally, something you have rewatched) become little more than advertisements for a product which may not even be current anymore. In the case of "Salem's Lot", the R1 DVD has been out of print for some time so if you do want to see it, you'd be better off tracking it down online. As ever, YouTube is your friend. Isn't it weird how a DVD can become out of print in America and be worth around $40 while still being on sale in British supermarkets for less than £5? If anyone wants to buy the complete miniseries of "Salem's Lot", I suggest ordering it from a UK site. Don't confuse it with the 2004 remake starring Rob Lowe which is also "OOP" and selling for crazy prizes when it isn't even worth a dollar. Anyway, back to the past since I have just spent over three hours rewatching "Salem's Lot" on the DVD which I bought when it first came out in 1999. It was actually the first R1 DVD which I ever bought, and I got it from one of the Sam Goody stores for what was the equivalent of £10 due to the exchange rate. It was during my first visit to America so that particular DVD now has some sentimental value. 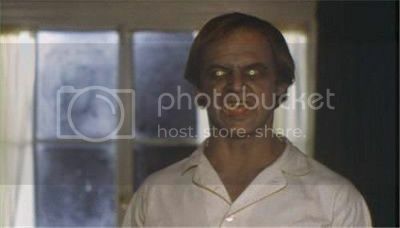 In fact, "Salem's Lot" as a movie will always have a lot of sentimental value to me. 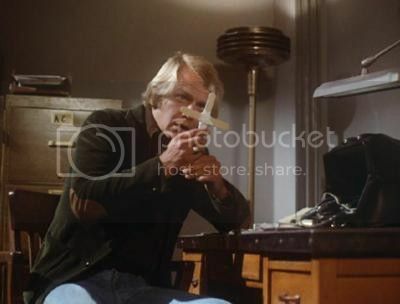 I remember watching it on television when it was aired, talking about it with my friends at school, and even making two ice lolly sticks into a crucifix just like David Soul did. Yes, I know now that he really used tongue depressers, but we didn't have those. 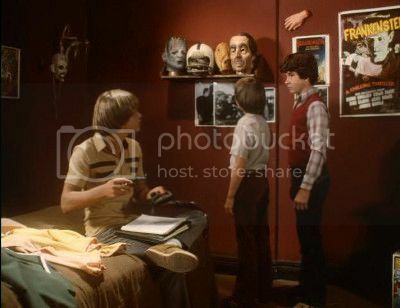 All nostalgia aside, the scene in "Salem's Lot" which haunts me to this day was the first one with the creepy little boy scratching at the window and then floating in to bite his brother. The trauma was so great that I always cover my eyes when I rewatch that part of the film and can't even bear to look at a picture of it. You can only imagine how horrifying it was for me when I went looking for pictures online to put into this post. "Look at me, Teacher! Comment, rate and subscribe!" I didn't find Geoffrey Lewis scary at all so I had no trouble with finding something which I could caption with his famous and excessively repeated quote. 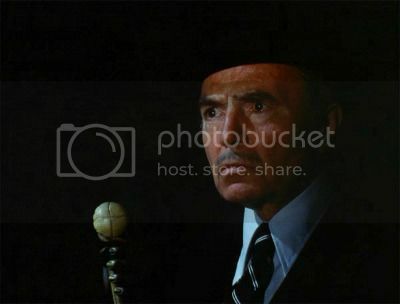 How many horror movie villains since have told their victim to "Look at me! Look at me!" as an homage to "Salem's Lot"? I've mentioned them every time they crop up in previous posts so you'll just have to read back to discover them for yourselves. Suffice it to say that it's not just YouTube which is full of attention seekers. Among many others, I did find the graveyard scene quite disturbing when I first saw it, and Geoffrey Lewis was perfect as Mike Ryerson, but I've never truly been able to put his role alongside Clint Eastwood and a monkey out of my head. Barlow also wasn't exactly terrifying for me after his first jump scare appearance. I'm probably weird, but I thought he was kind of cute. Reggie Nalder's version of Nosferatu with those nasty teeth and his sticky out ears has become almost as iconic as Max Schreck's. I was even encouraged to buy the purple-covered Stephen King paperback version of "Salem's Lot" just because of the image on the front. I never finished reading the book as, despite a few differences, it seemed much the same as what I'd watched. Re-reading "Salem's Lot" is yet another thing to add to my bucket list. As much as I loathed Lance Kerwin as Mark Petrie and wanted him to die in all sorts of horrible ways which were never likely to happen in a made-for-TV miniseries, I have a suspicion that I've spend a good part of my life trying to emulate that character. I never had the lovely Aurora model kits that he did, but I have to admit to buying the Monogram versions and spending many hours painting them. Hopefully, I just liked monsters and didn't take on any of his more irritating personality traits. As a prototype of Charlie Brewster from "Fright Night" which, obviously, was just a comedic version of "Salem's Lot" anyway, Mark Petrie is at the top of my "All time most hated horror movie characters" list. I've often toyed with the idea of spending a week re-editing "Salem's Lot" to remove every single frame that he's in because he added absolutely nothing to the film at all for me apart from annoyances. I hate to say it, but Bonnie Bedelia was mainly in filler scenes too. I suppose the romance was necessary to provide a "damsel in distress" moment later, but what did she add otherwise? She didn't even look "hot" until she became a vampire, and then she didn't get to do anything! I vaguely remember that the vampiric version of Susan Norton had some more sexually enticing scenes in Stephen King's novel. I don't like comparing books to movies though as they are rarely the same. 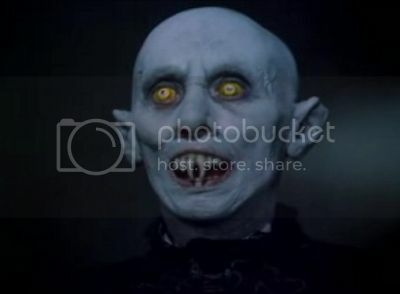 As a miniseries, "Salem's Lot" was (and still is) a genuinely terrifying experience which was only compromised by having to offset the horror which was allowable on TV with too much "soap opera"-style padding. Stephen King prefers the trimmed movie version, but as he also thinks that "The Strangers" is a great film, I think even his opinion can be somewhat discounted. The pacing of the movie version is tighter, and a greater percentage was devoted to the scary parts, but you can't beat seeing the whole thing. One of my claims to fame which may, in reality, be entirely due to coincidence was that after buying the cut-down-to-a-movie VHS version, I wrote to Stephen King in the '90s and naively asked him if he could put some pressure on Warner Bros. to release the full miniseries which had never been repeated and hadn't been seen in the UK for over sixteen years. About six months later, guess what appeared in my local MVC? 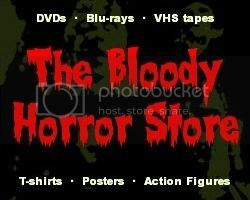 At £16.99, it was the most expensive VHS tape that I ever owned, but I was still overjoyed! As a DVD, "Salem's Lot" doesn't have anything much different to the VHS version. The sound is still mono, and there aren't any extras apart from the international trailer. As the only available version of one of the greatest vampire stories ever made, I really don't understand why it was never released again with a director's commentary and all the other extras which we know and (some of us) love. If "Salem's Lot" ever gets released as a Blu-ray, I will be one of the first in line to buy it, but I doubt that it will ever happen. If you also have the DVD of "Salem's Lot" consider yourself lucky, and make sure you watch it again this Hallowe'en.